After the 1803 Louisiana Purchase, President Thomas Jefferson ordered an expedition to explore the northwestern portion of the country by a group of Army volunteers called the Corps of Discovery. 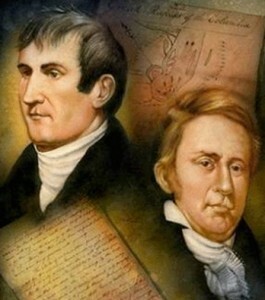 The expedition was organized under the command of Captains William Clark and Meriwether Lewis. The objective of the expedition was to explore and map the unknown territory, to study its natural resources and establish a relationship with local nations, but most importantly to establish a U.S. government presence for legal claim. The Corps of Discovery Captains, William Clark and Merriwether Lewis. 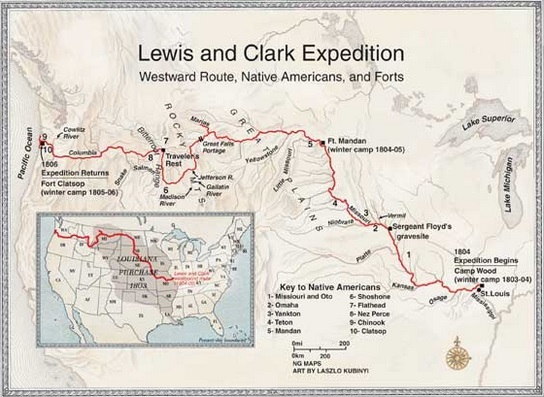 The Corps of Discovery Expedition is best known as the Lewis and Clark Expedition. All of its 33 members were handpicked. 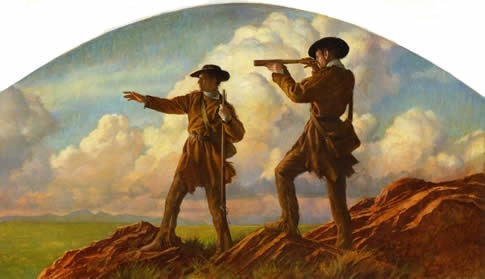 Lewis and Clark were chosen for their leadership abilities and others for their skills in hunting, wood working, exploring, cooking and interpreting local languages. The exploration departed on May 1804 form St Louis and reached the Pacific Ocean on November 1806. 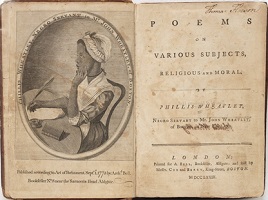 The expedition kept daily journals of their activities and findings. 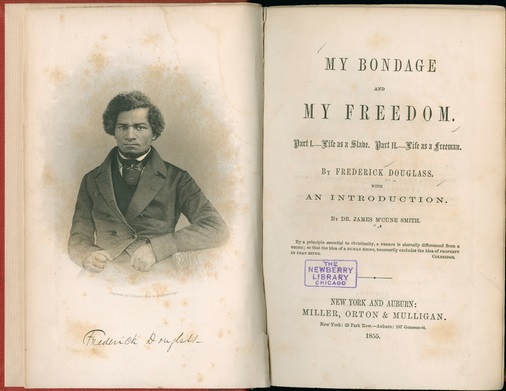 Along the way, before they reached Fort Mandan, where they settled for the winter, two members were expelled, one for desertion and the other one for mutinous acts. 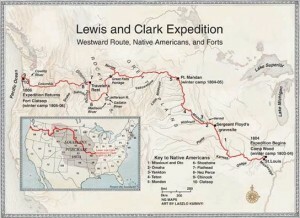 Westward Route of the Lewis and Clark Expedition. 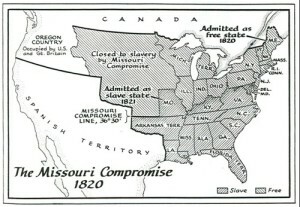 Map credit: National geographic. When the explorers reached Fort Mandan in North Dakota they hired Hidatsa interpreter, Toussaint Charbonneau; and his wife Sacagawea, who spoke the Shoshone language, essential for the success of the next part of the journey. Once they reached the Pacific shores on November 1805 they built Fort Clatsop in present day Astoria, Oregon where they spent the winter. This effort resulted in the strengthening of the US claim of land in the Pacific North West paving the way for the first American settlement, the Pacific Fur Company Post. The Corps of Discovery departed back on the spring of 1806 and arrived at St. Louis on September 23, 1806. 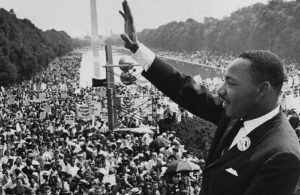 The members of the expedition were received like heroes.